Damien Howson (ORICA-Scott) has finished safely in the bunch to hold on to his overall lead in the 2017 Jayco Herald Sun Tour in Kinglake, the South Australian crowned winner of the 64th edition of Australia’s oldest stage race on Sunday. For today’s full stage results click here. Howson maintained his lead from Thursday, where he claimed victory on the queen stage atop of Falls Creek. 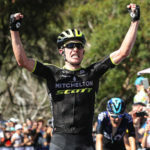 Howson joins a list of names including Tour de France winners Chris Froome and Brad Wiggins, along with Russell Mockridge, John Trevorrow and Simon Gerrans on the Jayco Herald Sun Tour’s honour roll. 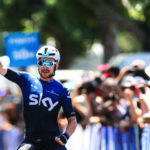 Team Sky’s Ian Stannard came out on top on Sunday’s final day of racing, having survived in the remnants of the breakaway that spent the majority of the 121km stage at the front of the race. It was a third victory for Team Sky this week, Stannard finishing ahead of a late charge from Aaron Gate (Aqua Blue Sport), and Taco van der Hoorn (Roompot – Nederlandse Loterij). “We’ve come here and wanted to have some fun and some good racing – that’s what it’s been about and it’s worked well for us,” Stannard said. Defending champion, and Team Sky leader Froome said that Stannard’s stage victory said a lot about the classics specialist’s strength. Froome also paid tribute to the efforts of Howson. The Jayco Herald Sun Tour departed Kinglake Village for four laps of a 31.1km circuit through the Kinglake National Park under threatening skies. The summer storms rolled across the hills on the outskirts of Melbourne, with minimal rain falling on the peloton throughout the stage, while the circuit remained wet. Before the start of the first ascent of the four and a half kilometre long KOM, the beginning of the day’s breakaway started to form with 12 riders soon joined by six more. Stannard, Tim Ariesen, Taco van der Hoorn (Roompot – Nederlandse Loterij), Sergey Nikolaev (Gazprom – Rusvelo), Tanner Putt, Travis McCabe (UnitedHealthcare), Aaron Gate, Larry Warbasse (Aqua Blue Sport), Alistair Slater (Condor JLT), Ben Hill, Tim Guy (Attaque Team Gusto), Robbie Hucker (IsoWhey Swisse Wellness), Daniel Fitter (NSWIS), Jason Christie, Sam Dobbs (New Zealand National Team), and Cyrus Monk (Drapac Pat’s Veg). Darcy Ellerm-Norton (St George) was among the group, but a mechanical saw him relegated to the peloton. Hill added to his overnight tally in the battle for the polka dot jersey, taking 20 more points on the first KOM of the day for his lead in the Subaru King of the Mountains Classification. On the second lap, Hill again took maximum points, ensuring his victory. Jake Kauffmann (NSWIS) back in the bunch need not worry about his lead in the Metro Trains Sprint Classification, with the breakaway unable to do any damage to the former rugby union player’s hold of the green jersey. “I had a decent enough lead after the first two days, there was a couple of guys I had to watch but as long as they didn’t get up the road, it was plain sailing,” Kauffmann explained. The breakaway hit maximum advantage with just over two laps of the course remaining, 4:30 of clear air ahead of the peloton. 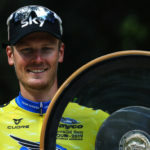 That advantage diminished steadily, and it was on the penultimate lap that Froome and Team Sky teammate Luke Rowe attempted an ill-fated attack. Stannard would hang tough, with his teammates unable to bridge the gap, the breakaway’s advantage over the peloton whittled down to 2min26sec at the bell lap with ORICA-Scott and the KordaMentha Australian National Team doing the bulk of the chasing. 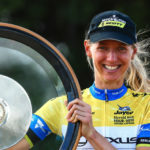 The KordaMentha Australian National Team was keen to protect their leader, Jai Hindley who was second on the general classification, 38 seconds behind Howson. The bell would signal a series of attacks from within the breakaway group, Stannard, Gate, van der Hoorn, Slater and Monk splintering away with a few other stragglers eventually able to make up lost ground. Monk was the first man over the final KOM, but Hill’s earlier efforts had been enough to ensure he had a double celebration for his 27th birthday. “I think I was the last rider to get across to the break so I was pretty relieved,” Hill said. His efforts come a year on from securing the sprint classification and give Hill an impressive collection of jerseys. The attacks came thick and fast from the peloton, with Ben Dyball (St George) attempting a last push, but it was Howson following his wheel. Froome would go on the offensive again and so would his teammate Sebastian Henao, with the tail end of the breakaway in sight on the final climb. The stage however belonged to Stannard and the race, to Howson. The 2017 Jayco Herald Sun Tour will be presented by Jayco and the Herald Sun, along with the continued support from the Victorian State Government.